The festival of the thrush, Sagra del Tordo, is held in the old Tuscan town of Montalcino on the last October weekend. Most often, the word «sarga» refers to gastronomic festivals in Italy which are dedicated to some specific food or dish typical for the area. On the Sagra del Tordo festival, according to its name, you can try the specialty. However, it’s not only culinary secrets of cooking thrushes that makes essence of this feast. «Sarga del Tordo» is a medieval festival. The Sunday Archer’s Tournament is the key event of it. The thrush festival held in the late fall appeared as the festival of the successful end of the hunting season. The festival program includes two days. But residents and visitors of Montalcino are carried away by the holiday atmosphere and preparations on Friday night already. The colorful parade accompanied by drums and trumpets goes along streets of the old town on Saturday. Its participants are dressed in medieval clothing. Mouth-melting smells in the old fortress mean that the two-day-long feast of food and wine is beginning. The Saturday night is devoted to the festive dinner which takes place in every town district. Guests of the party try to cheer their archers by every possible way and to make them believe in victory. As a rule, the dinner is available for a limited number of guests, so tourists should take care of reservations in advance. Sarga del Tordo culminates on Sunday. The festive procession goes along streets and on squares. Old music bands sound everywhere. Participants of the tournament are being blessed. The Archers tournament takes place in the second half of the day. Two archers from each of the four Montalcino districts (Pianello, Travaglio, Ruga, Borghetto) take part in it. Each archer gets 5 arrows to hit the target. The district which gets more points than the rest is the winner. Festive events end with a ceremonial dinner. However, even after it ends the winning district continues to celebrate all year round. 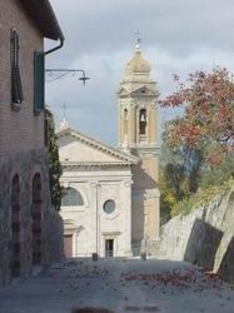 If you want to join the festival of the thrush, you should reserve accommodation in Montalcino in advance as while the festival the town is crowded with tourists. If you want to feel the color of Tuscan life in full, you should visit the town of Montalcino. It is located on a picturesque hill. The most well-known local wine is Brunello di Montalcino.